In today’s highly competitive customer service industry, customers are more demanding and powerful than before. They are also more knowledgeable and tech-savvy than ever. Therefore, to impress them and keep their business, you need to have impeccable customer service with omnichannel and consistent support. In 2019, not being able to offer uncompromised support via mobile is not only unacceptable but also self-sabotaging for a business. In a time when 87% of customers actually use mobile devices to make purchases, businesses must insist on having a quality mobile-based customer service in place. Or else they must face the wrath of their frustrated customers. Provide your customers with mobile-friendly FAQs, documentation and self-support videos. Your mobile website/app landing page must display your customer service button prominently. Give your customer an easy way to contact customer support from the mobile. It can be prominent, but non-intrusive dial-for-support or live-chat-for-support button that lets them communicate with you without leaving the page. Single-tap sensitive customer service links are preferable. A real-time tracking system for mobile-based customer service queries is also important. Customers today are fond of instant resolutions. That is why they prefer social media platforms (especially Twitter) to catch the attention of companies and have them resolve customer service issues promptly. 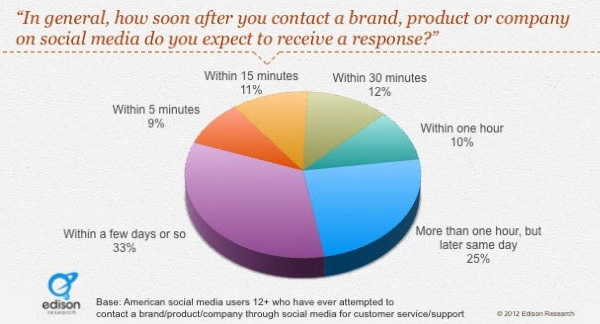 In a recent study, 42% of the participants said they expected companies to respond to social media mentions within 60 minutes. Understand your customers’ expectations when they post their queries on social media, anticipate their needs and then address their concerns. Aim to respond to all queries within the first 60 minutes. Even if you cannot offer a solution in that time frame, acknowledging the issue and assuring the customer of a response can go a long way. Set up keyword tracking for your social media pages and never miss any customer’s comments. Provide seamless customer support by integrating social media with live chat. Every business needs to prioritize their enterprise and high-level customers and therefore must offer the quick-resolve routes that present the least hassles. In these cases, a face-to-face call or live chat can be their best aid to boost customer experience. According to a Forrester study, interactive chat can result in as much as a 120% ROI in a 6-month payback period. Install a reliable live chat on your website and app across devices. Create a flexible script with room for improvisation as per the customer’s needs. A list of conversation points can be helpful too. Use a CRM to store important information about customers that you can refer to for context before attending a customer’s call. Keep product manuals and resources ready to send across to your customers when required during your call. Allow customers to lead the call with their requirements but do not allow them to deviate from the topic. According to a Zendesk study, 50% of customers want to resolve their issues by themselves, without having to involve a customer support team. They cost your customer service team the least and turn better cost-to-profit ratios. Such customers can be satiated with self-serve FAQs, documentation and video content. Make your FAQs comprehensive, organized, and easy to navigate. A/B test for your FAQ and documentation landing pages and optimize for the best design and ease-of-use. Create excellent copy that offers an excellent self-service experience. Email should be part of your customer service system. It’s easy to manage, still effective and can resolve a good number of your customers’ queries. And with CRMs that offer email automation workflows, email customer service has become an easy to manage customer service channel. Keep your automation workflows under frequent checks, and tweak email drafts and automation schedules as and when required. Use an actual email for replies so your customers feel cared for and can interact with your automated messages. If you resolve common issues in a completely automated fashion, you will only have to take care of any unusual activity as and when they occur. These are a few ways you can improve customer experience through multichannel communication. The key to success of a customer service system, omnichannel, multichannel, or otherwise, lies in the proper understanding of what the customer wants and needs, empathizing with them, and delivering prompt resolution with a bit of personal touch. Even with the right technology, a customer service system is sure to fail if it cannot feel the pain points of your customers and empathize with them. A healthy dose of empathy, personalization, and prompt resolution at the right time through the right channel can give a good boost customer experience and earn your business some loyal customers.